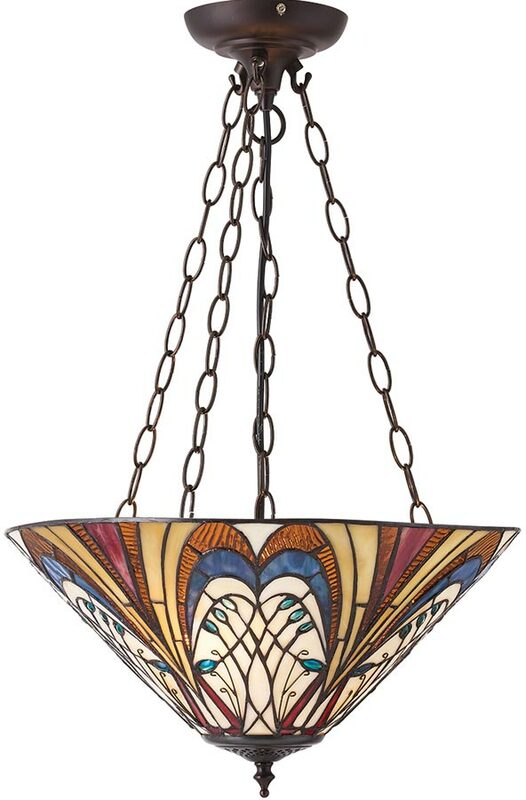 The Hector medium Art Nouveau style 3 light inverted Tiffany pendant is vibrant and exciting. 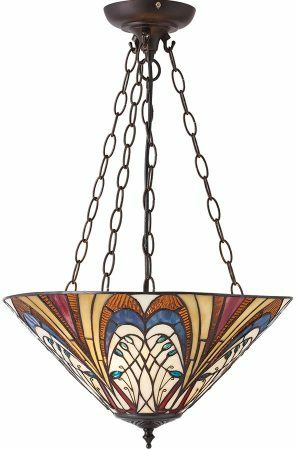 A wonderful hand crafted Tiffany glass shade featuring vibrant colours in a geometric design, suspended from a dark bronze finish ceiling mount and four chains. A wonderful medium sized Tiffany uplighter pendant, with vibrant blues, reds and golden amber laid over a neutral cream base colour, this lovely design will grace any period Art Nouveau or Art Deco theme. This is a hand-crafted Tiffany shade pendant uplighter and the colours may differ slightly from the image shown, as each piece of glass is hand-made and may differ slightly in colour or shade. This should not be seen as a fault, rather something that makes each Tiffany shade unique. The Hector medium Art Nouveau style 3 light inverted Tiffany pendant, designed and manufactured by Interiors 1900.